The US dollar dipped into negative territory today after Fed vice chair Stanley Fischer said that inflation is low, but this would be a temporary situation. The move comes on the back of Friday’s jobs data which markets took as broadly positive. The nonfarm payroll figure for July came in at 215,000. This was just below the forecasted number of 220,000. However, an earlier report from private data collection firm ADP had prepared markets for a potential disappointment this month. Figures released Monday also showed a rise in consumer borrowing, however this also underscores the reliance on consumers to drive the economy forward. The latest batch of data caused the US dollar to suffer its biggest fall in two weeks with most of those movements on the euro and British pound. 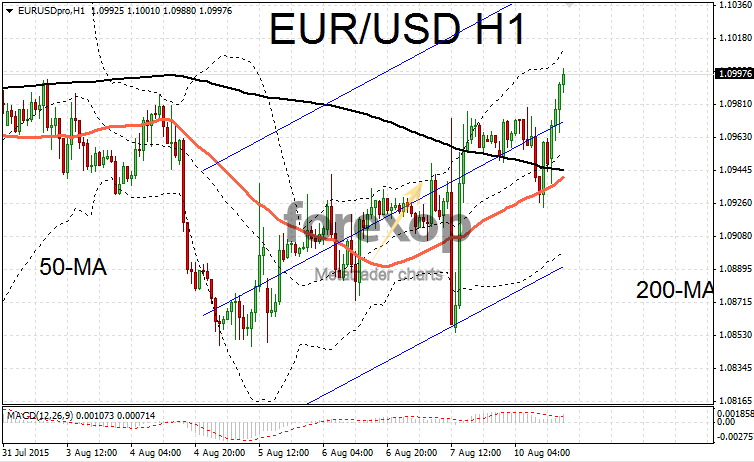 EUR/USD put on a late surge rising to cross the 1.10 barrier. 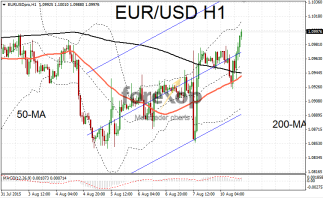 On the hourly chart EUR/USD is rebounding strongly above the 200-point moving average. The 50-point moving average is also close to a bullish upwards crossing. This comes despite economic data from the Eurozone being decidedly mixed of late. The current moves are being driven by sentiment towards the US dollar as the point for the Fed to begin lifting rates fast approaches. Germany’s trade balance posted a respectable rise in June. Figures released by the official Statistisches Bundesamt reported a surplus of 24B euros – up from 19B euros the previous month. Industrial production dipped however with latest data reporting a sharp contraction of 1.4% in June. Not surprisingly, Greece also reported a big fall in industrial output. Output fell at an annualized 4.2%. Greece is close to securing a substantial EU funded bailout agreement of some 86 billion euros – a good portion of which will need to be used to re-capitilize the country’s collapsing banking system. It is expected though that Greece will need ongoing financial aid from the Eurozone for years to come – a reason why some in the markets would have preferred to see a Greek exit from the Eurozone. Cable regained strength after suffering three days in a bearish decent. 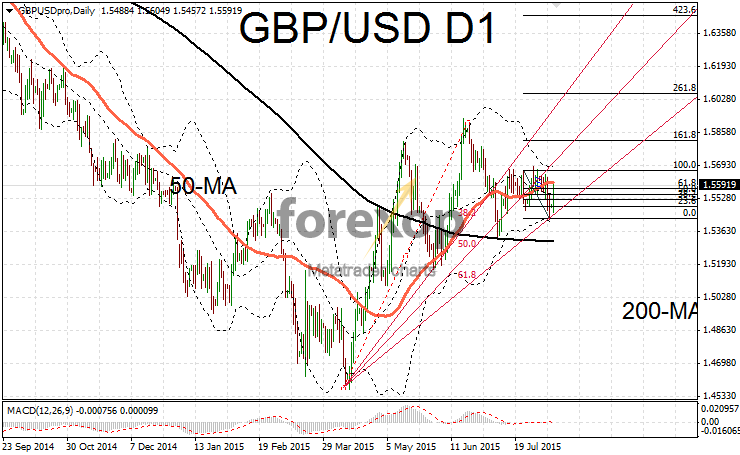 GBP/USD rebounded up to the 1.56 level on strong momentum. The pair encountered resistance around 1.5594 which coincides with the 50-day moving average. Latest figures showed that the UK trade deficit widened significantly in June. Overall however the quarterly deficit fell to a four year low at £4.9B. With the Bank of England’s statement and minutes out of the way, traders felt confident enough to push GBP/USD to new highs. The latest move pushes cable firmly back within the upward channel established since April this year. Resistance is expected around 1.5634 and then at 1.5669. Then support is anticipated at 1.5548 and beneath at 1.5429.